Ben Jaros was a teenager when the Detroit Stars played their home games in Hamtramck. 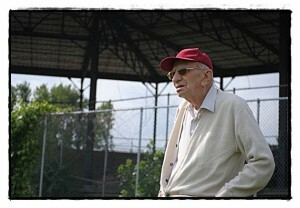 Hamtramck Stadium may be a historic site now, but for local resident Ben Jaros it’s still a vivid memory. Back in the 1930s – when the Detroit Stars played in Hamtramck – Jaros was a teenager living on Trowbridge. He turns 95 years old in September, and his memory is razor sharp. Fortunately for Jaros, he only needed Hamtramck local Andy Love to see the games. Love played for the Stars and lived on Dequindre near Caniff, and Jaros would often see Love walking down Campau toward the ballpark. During those games, Jaros would watch Love play practically every position on the field. Being a Hamtramck High School graduate, Love was Jaros’ idol and his favorite player. But he wasn’t the only one Jaros remembers. Although those days are now long gone, Jaros still remembers them like yesterday. It’s as impressive as it sounds, but he shrugs it off with a casual nonchalance. “I mean, with a name like Turkey – you can’t forget a name like Turkey,” he says. I am Turkey Stearnes’ oldest daughter and I would like to meet this guy. It’s always a pleasure to talk to people who saw my dad play. My father stopped playing the year I was born so my sister and I never had the pleasure of seeing him play.